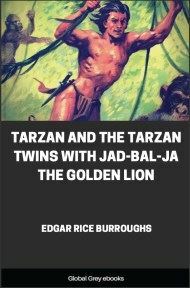 This is the twenty-third book in the Tarzan Series. Written from January to February 1940, the story was never published in Burroughs' lifetime. 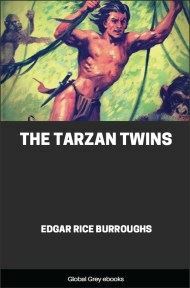 Tarzan tracks down a man who has been mistaken for him. The man is under the delusion that he is Tarzan, and he is living in a lost city inhabited by people descended from early Portuguese explorers. The plot devices of a lost city and a Tarzan "double" or impostor had been used by Burroughs in some previous Tarzan novels. MAN HAS FIVE SENSES, some of which are more or less well developed, some more or less atrophied. The beasts have these same senses, and always one and sometimes two of them are developed to a point beyond the conception of civilized man. These two are the sense of smell and the sense of hearing. The eyesight of birds is phenomenal, but that of many beasts is poor. Your dog invariably verifies the testimony of his eyes by coming close and smelling of you. He knows that his eyes might deceive him, but his nose never. And the beasts appear to have another sense, unknown to man. No one knows what it is, but many of us have seen demonstrations of it at one time or another during our lives--a dog suddenly bristling and growling at night and glaring intently and half-fearfully at something you cannot see. There are those who maintain that dogs can see disembodied spirits, or at least sense their presence. 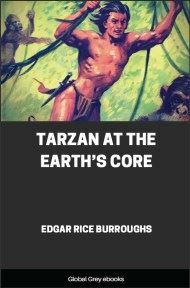 Tarzan of the Apes had the five senses that men and beasts share in common, and he had them all developed far beyond those of an ordinary man. In addition, he possessed that strange other sense of which I have spoken. It was nothing he could have defined. It is even possible he was not aware that he possessed it. But now as he moved cautiously along a jungle trail, he felt a presentiment that he was being stalked--the hunter was being hunted. None of his objective senses verified the conclusion, but the ape-man could not shake off the conviction. So now he moved even more warily, for the instinct of the wild beast for caution warned him not to ignore the portent. It was not fear that prompted him, for he did not know fear as you and I. He had no fear of death, who had faced it so often. He was merely activated more or less unconsciously by Nature’s first law--self-preservation. Like the dog that senses the presence of a ghost at night, he felt that whatever had impinged upon his consciousness was malign rather than beneficent. Tarzan had many enemies. There were his natural enemies, such as Numa the lion and Sheeta the panther. These he had had always, ever since the day he had been born in the lonely cabin on the far West Coast. He had learned of them even as he suckled at the hairy breast of his foster-mother--Kala the great she-ape. He had learned to avoid them, but never to fear them; and he had learned how to bait and annoy them. But his worst enemies were men--men whom he had to punish for their transgressions--African natives and white men, to him, Gomangani and Tarmangani in the language of his fierce, shaggy people. Numa and Sheeta he admired his world would have been desolate without them; but the men who were his enemies he held only in contempt. He did not hate them. Hate was for them to feel in their small, warped brains. It was not for the Lord of the Jungle. Nothing out of the ordinary may go unchallenged or uninvestigated by the wild beast which would survive; and so Tarzan took to the trees and doubled back upon his trail, directed by a natural assumption that if he were being stalked the stalker had been following behind him. As he swung down wind through the trees, following the middle terrace where the lower branches would better conceal him from the eyes of the enemy on the ground, he realized that the direction of the wind would carry the scent spoor of him he sought away from him and that he must depend wholly upon his ears for the first information of the presence of a foe. He commenced to feel a little foolish as the ordinary noises of the jungle were unbroken by any that might suggest a menace to him. He commenced to compare himself with Wappi the antelope, which is suspicious and fearful of everything. And at last he was upon the point of turning back when his keen ears detected a sound that was not of the primitive jungle. It was the clink of metal upon metal, and it came faintly from afar. Now there was a point to his progress and a destination, and he moved more swiftly but none the less silently in the direction from which the sound had come. The sound that he had heard connoted men, for the wild denizens of the jungle do not clink metal against metal. Presently he heard other sounds, the muffled tramp of booted feet, a cough, and then, very faintly, voices. Now he swung to the left and made a wide detour that he might circle his quarry and come upon it from behind and upwind, that thus he might determine its strength and composition before risking being seen himself. He skirted a clearing which lay beside a river and presently reached a position to which Usha the wind bore the scent spoor of a party of blacks and whites. 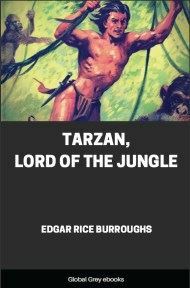 Tarzan judged there to be some twenty or thirty men, with not more than two or three whites among them. When he came within sight of them, they had already reached the clearing beside the river and were preparing to make camp. There were two white men and a score or more of blacks. It might have been a harmless hunting party, but Tarzan’s premonition kept him aloof. Concealed by the foliage of a tree, he watched. Later, when it was dark, he would come closer and listen, for he might not wholly ignore the warning his strange sense had given him. Presently another noise came to his ears, came from up the river--the splash of paddles in the water. Tarzan settled down to wait. Perhaps friendly natives were coming, perhaps hostile; for there were still savage tribes in this part of the forest.